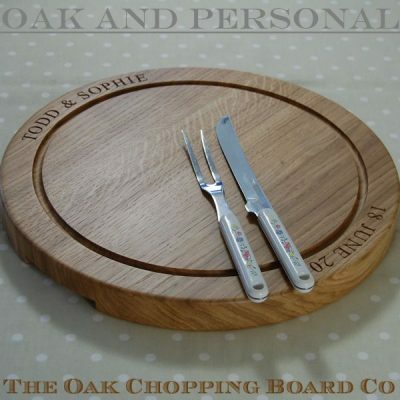 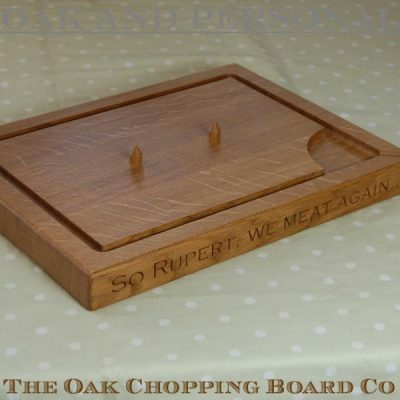 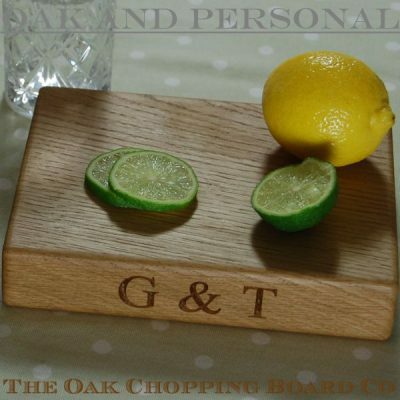 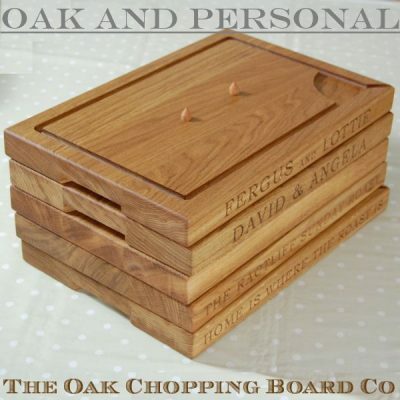 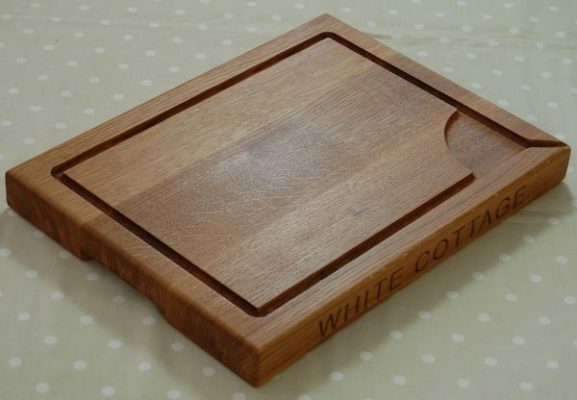 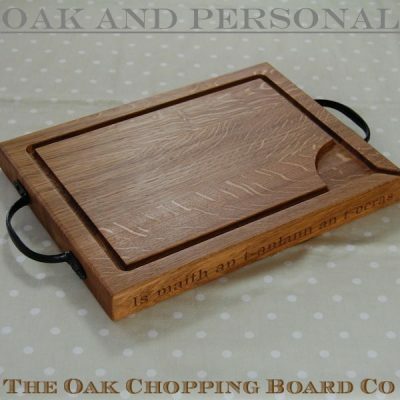 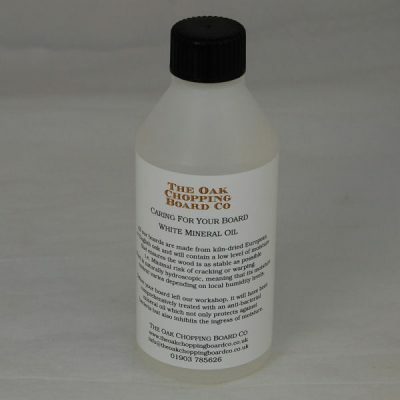 Our range of stunning oak personalised carving boards here at The Oak Chopping Board Co is hand made from full-length stave oak. 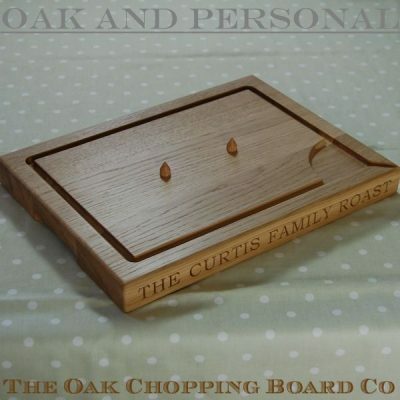 Differentiated from our other boards by an extra deep groove, the rectangular ones incorporate a well to capture excess meat juices, and a spout to aid pouring for making delicious gravy! 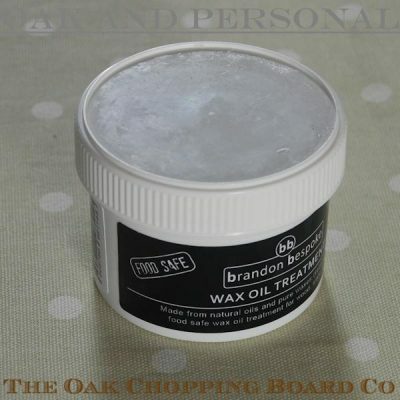 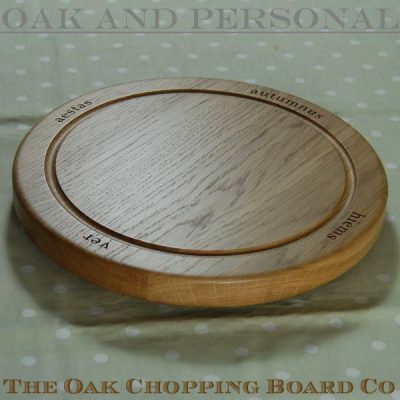 Whether you choose the rectangular carving board available in three sizes (30x40cm, 30x45cm and 38x50cm) and two thicknesses (2.7cm and 4.0cm), or the circular carving boards at 42.5cm in diameter and 4.0cm thick, you can be assured that the carving board you purchase is unmatched in its quality by any other boards on the market. 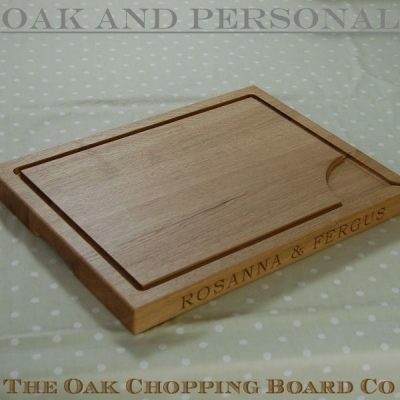 Both the rectangular oak carving boards and the round carving boards may optionally have recessed handles (standard on 38x50x4cm carving boards) at each end which helps when lifting or carrying as the larger boards weigh in excess of 6kg without the Sunday roast. 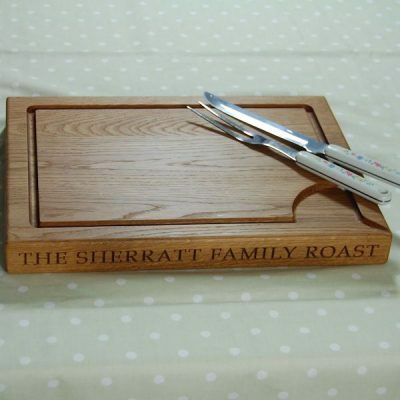 We have also recently introduced a variant that incorporates spikes to hold the roast during carving, and a version that has rustic, wrought iron handles is available too. 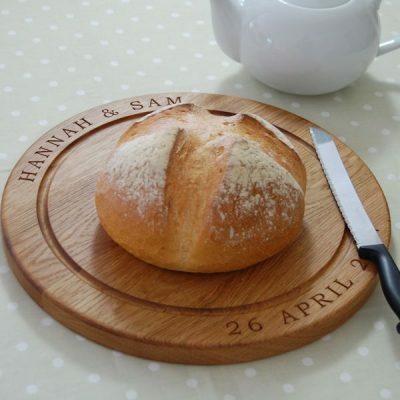 Each wooden carving board may be personalised with your own message on the edges and/or the face (face only for circular boards). 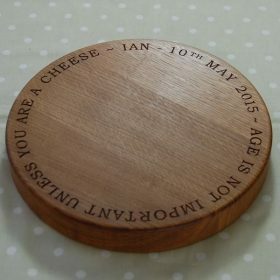 If desired, a design from our range of 2D and 3D motifs is available, and on any of the boards we can engrave a "secret" hidden message underneath. 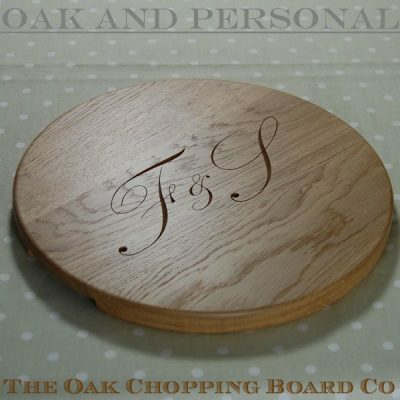 We can also create your own unique personalised cipher. 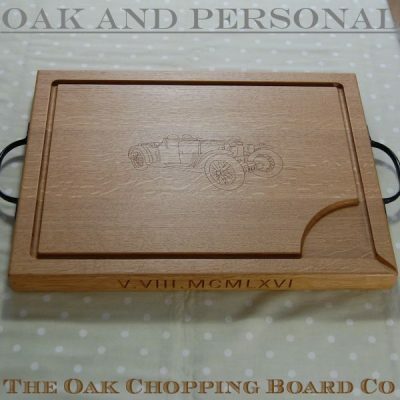 Our normal lead time is 7 to 10 days, but even if you have left it a little late we will do our best to ensure your gift arrives in time.